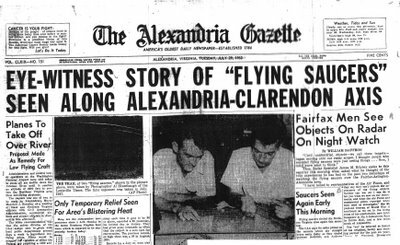 I was fascinated by your account of the 1952 UFO flap around DC. I'm 68 now, but at age 13, I was there, living with my family -- temporarily -- in the sedate, colonial Alexandria home of my mother's sister and her husband. (My father was an Army officer. En route to Bogota, Colombia, Dad was going through Pentagon briefing.) What I recall as most striking about this flap was the ubiquitous excitement on local television, newspapers, and so forth. You didn't mention this in your piece, but individual sightings seemed to be all but continuous. Cars were piled up along the shoulders of the Mt. Vernon Parkway. Crowds gazing out across the Potomac toward DC and National Airport came and went. I remember my grown cousin -- Jim (a broker in the family real estate business) -- arriving at the house one day all but breathless with excitement over a sighting. As a sociologist I've long been fascinated by how civil authorities are able to virtually erase the direct experience (in this case) of literally hundreds of witnesses. Years would pass before my own inquiries would lead me to understand that "UFOs" represent a vital dimension of the human picture -- hidden though it is behind smoke, mirrors, disinformation -- and sheer ignorance.